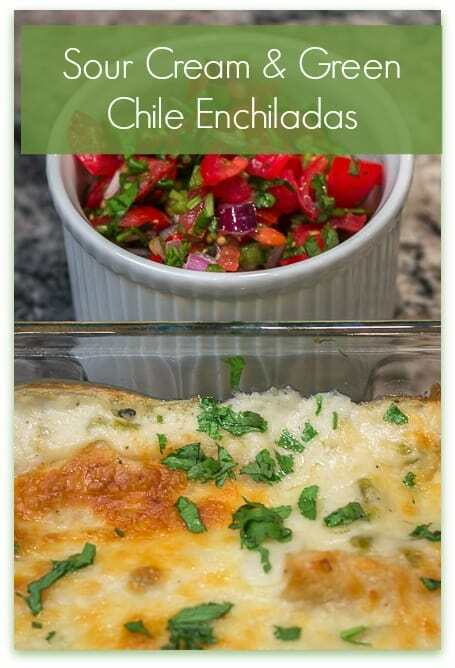 I first tasted this unbelievably easy recipe for Sour Cream and Green Chile Enchiladas when I was growing up in West Virginia. 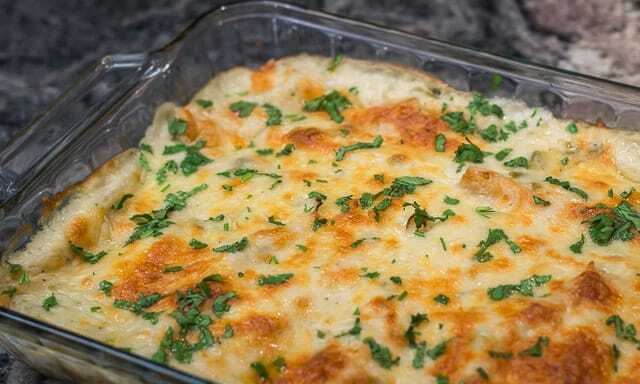 This recipe is pure easy, cheesy, creamy, comfort-food goodness! My sister learned it from her roommate, from her time at Abilene Christian University, in the 1970’s. And while we didn’t know it at the time, we were on the cutting edge of a culinary trend, that was about to sweep the nation: Tex-Mex. Easy, cheesy, creamy Tex-Mex comfort food! 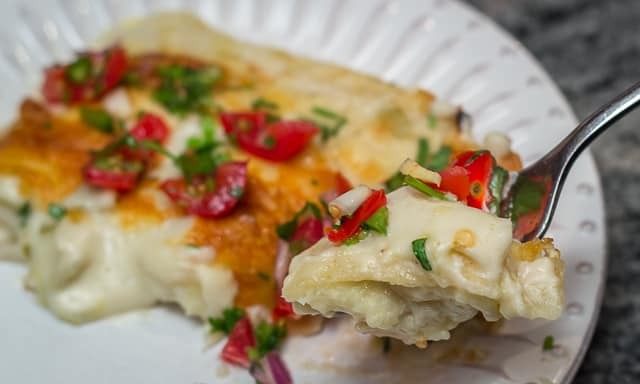 Sour Cream and Green Chile Enchiladas are a Family Favorite. My husband and I have been making this dish ever since we got married, thirty years ago. I introduced him to it, because I knew that not only was it delicious, it was also easy to throw together when I got home from a long day of work. Once I’d made the white sauce, grated the cheese and chopped the onions, we’d form a little assembly line of two. I’d quickly warm and soften the corn tortillas in oil, and he’d stuff them with the cheese and onions, and roll them. We discovered that of the two of us, he was the much more efficient enchilada stuffer/roller. Served with homemade pico de gallo, or fresh tomato salsa. Be sure to serve your favorite tortilla chips on the side, to help scoop up all that yumminess. I made this image specifically for those who like to pin to Pinterest, and I hope you will! Pin it, that is. Just out of the oven! Molten, creamy cheesy goodness. Speaking of pico de gallo, I like to make a small batch of homemade pico de gallo to go with the Sour Cream and Green Chile Enchiladas, because pico de gallo (fresh salsa) adds more flavor, color, and texture to the dish. But serving a jarred red or green salsa would be a perfectly acceptable substitute, if you’re in a hurry. 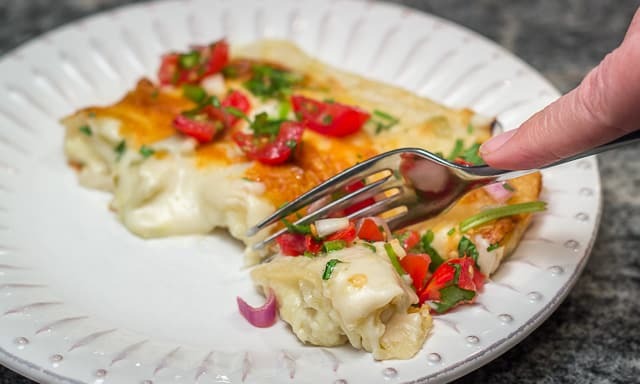 Sour Cream and Green Chile Enchiladas are an easily made weeknight meal, and sometimes, convenience is at the top of your priority list. This recipe is versatile enough for you to personalize it any way you and your family like. It’s at its very best when I’ve made it with homemade chicken stock. But if I don’t have any homemade broth in the freezer waiting to be thawed, you can bet I’ve used canned or boxed broth plenty of times. If you want to go completely vegetarian, you could easily substitute vegetable stock for the chicken broth. If you like your food spicier, you could use Pepper Jack cheese, instead of Monterey Jack (or a combination of the two). And, If you happen to have any leftover chicken/rotisserie chicken, by all means, throw in some of that chicken. This recipe is often made with chicken, but I wanted you all to experience it the way I first did, in all its easy, cheesy, creamy goodness. Come a little closer, my dear! Bite me!!! 😀 You know you’re going to want to make this one! Easy, cheesy, creamy Tex-Mex goodness, this is a weeknight meal that you're going to CRAVE to make again, and again. Melt butter in a medium sized saucepan over medium heat. Add flour, and brown the mixture for a minute or two, stirring constantly. Slowly, about 1/2 c. at a time, stir in the chicken broth, to make the white sauce. Sauce will lump slightly with each addition of chicken broth, but keep stirring, and adding more broth, and gradually the sauce will become the nice creamy consistency you want. At that point, add the drained green chiles, and stir some more. Finally, add the sour cream, stir, and remove from heat. Heat the oil in a small, shallow skillet, over medium heat, and when hot, warm and soften the tortillas in the oil by frying them for about 5-10 seconds, per side. Drain on a plate covered by a paper towel, and blot the top of each tortilla. Ladle about 1/2 c. of sauce into the enchilada baking dish. I use a 9x13 baking dish. Put about 1/4 c. of Monterey Jack cheese and 1 teaspoonful of chopped onions on top of each tortilla, and roll them up. Place in baking dish on top of the 1/2 c. sauce. We can fit 8 enchiladas going down the long side of the pan, and then tuck 2 (going the other way) at the top and 2 on the bottom of the edge that isn't covered. That's not explained very well, but I think you'll figure it out. LOL! Pour all the white sauce over top, and if you have any cheese left over, you can just sprinkle that on top of the entire pan. Bake for about 20-30 minutes, till they're becoming slightly golden in color . Sprinkle with chopped cilantro and serve with pico de gallo and tortilla chips, if desired.